Own one of the most popular houseplants ever! A popular plant and rightly so - get yours now! Huge, glossy leaves feature deep cuts and holes. Popular with social media gardeners around the world! Suppled as an established plant in a 14cm pot. If there is one houseplant that has inspired generation after generation of indoor gardeners, then it has to be the Swiss Cheese Plant. 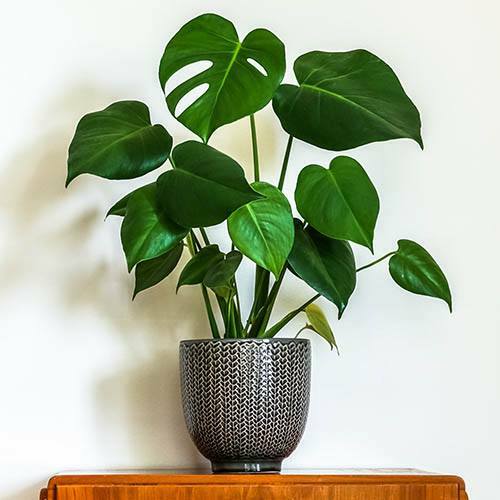 Instantly recognisable and a social media star, this is the one plant that sells out as soon as it is in stock - everyone wants a piece of Monstera so get yours while you can! The glossy deeply cut leaves are to be seen everywhere, from home-styling websites fabrics and wallpapers, you can't fail to miss them! A new introduction for us here at YouGarden, this beauty is a welcome addition to our range of houseplants, and it’s sure to be a popular choice with indoor gardeners. Easy to grow, and giving instant impact wherever you place it, everyone can benefit from the improvement to health and wellbeing that plants and gardening can bring. The huge, glossy leaves of Monstera deliciosa are what makes this plant a star of the home, easily adding green colour and a bit of tropical exuberance to any room. Young leaves are solid, and as the plant matures they begin to show the characteristic holes and serrations, hence the name 'Swiss Cheese' plant. Naturally a lazy climber, your plant will enjoy the support of a moss pole (not supplied) where you can push its aerial roots into the moss as they develop, helping to support it as it grows. A native of tropical rainforests, Monstera is a houseplant that's easy to keep happy - we recommend that you place it in bright but not direct sunlight indoors and mist the leaves regularly to provide humidity - plus they love a bit of a leaf-wipe now and again to remove dust and restore that glossy sheen. Decorative pot not included, see ‘as supplied’ photo. Place your Monstera in a bright spot out of direct sunlight. Mist leaves regularly and wipe occasionally to remove dust and restore their glossy sheen. Best grown in indirect sunlight in an average room temperature - avoid large temperature fluctuations. Water regularly and allow the soil to dry a bit between watering. Feed once a month with a general-purpose liquid houseplant feed. Mist leaves to maintain humidity. Do not place in direct sunlight, as this will scorch and yellow the leaves. Keep out of darker areas as growth will be spindly and new leaves will lose their holes and cuts.